J. Yubari's latest comic catalog, Muscle Fan Comics, has finally gone live! This is a brand new paid-content site consisting of a wide variety of talented artists and writers who have come together for the sole purpose of producing the highest quality female muscle growth comics possible. To celebrate the opening of this new site, we are currently offering a limited time deal we're calling "The Early Adopters Special!" What this does is give fans access to our exclusive comics at special price. This is a limited time offer until our official launch. All early adopters will keep the special price, even after the official launch, so long as they keep their membership! A brand new high-quality female muscle comic released every month. HD viewing format for all your devices. High-res female muscle pinups updated weekly. The chance to commission our artists to draw free pinups in our weekly raffle. Schooner the Sailor Girl and her friend Dimples find the island where the treasured strength-giving greens of the legendary Puffear the Pirate are located. Their boat is sunk by freak weather on the way in, but it’s not a coincidence. Two of Puffear’s most dangerous foes also have found the island, and they won’t give it up without a fight. La Fuerza Del Amor by Rolling Thunder, Kaka, and Wang. How soon after I join can I cancel? This is a subscription which you can cancel at anytime without hassle. What will the purchase show up as on my billing statement? On your credit/bank statement will be a discreet charge for "Interweb Comics LLC." What do I get by becoming a member? The chance to have your ideas commissioned by our artists. One request drawn per week! How does the artist commission feature work? Describe & submit your fantasy scenario to the weekly raffle. Each week one winner will be chosen at random. Winners will have their personal commission drawn by a professional artist then uploaded to the gallery page for fans to enjoy. If you don't win you will automatically be entered into the next raffle. Visit http://www.musclefan.com to create an account! Please contact support@musclefan.com with any issues you may encounter. 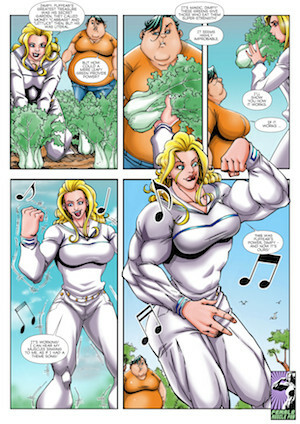 Visit www.musclefan.com to become a member and help support the creation of more awesome comics! Last edited by Valeyard Vince; 01-21-2015 at 01:03 AM. I am one of the co-founders of Muscle Fan Comics. We've spent the last 12 months writing, editing, drawing, coloring and curating our catalog meticulously—hopefully the quality is a reflection of our hard work. Most of all we did it for you to enjoy, so please send us any feedback you may have to help improve the website. Special thanks to all of those early adopters who are helping support this venture! Become a member to support future installments and request your own commissions. "Oi! Is it forcey-funtime yet?" Thanks! Let us know if you like the comics. Location: Now that, is a secret. While you are there, read up on my FMG stories The Edge Chronicles! WOW! You guys are awesome. Thanks for the positive vibes. Can I ask if there are any comics where the main character isn't... well, enthusiastic? For my part, I've always been more intrigued by TF stories where people don't necessarily embrace change. And it strikes me that many women might be more horrified than exhilarated at suddenly becoming a titanic amazonian behemoth, and furthermore at the prospect of living that way. I hardly ever see that in muscle growth stories. But that's just a personal preference, I'm not criticizing. Last edited by Case Scenario; 01-24-2015 at 07:02 PM. Not wild about spinach stories but still think this is a great deal. Bonus points if you make either a unwilling FMG or muscle transfer. I am so happy the site is live, been waiting months for this! Thanks again for all the positive feedback! I will keep these in mind for our future productions. On February 1st we will end the early adopters special. New 1-month memberships will cost $19.95. We will also have 3 month $39.95 and 1 year $99.95 options available. We have DOUBLED the speed of the release schedule from 1 issue per month to to 2 issues per month, effective immediately. That means if you get in now on the early adopters price ($11.95), you can keep the discounted price for as long as you remain a member while also enjoying 2 brand new issues every month. Sign up today or you may regret it later! Muscle girl gone wild! - Our 4th official Muscle Fan release titled, "Oopsy!" is now available for download in the members area.